If you LOVE wine and great atmosphere, how about those two together and more than 2,000 labels of wine on the shelves? Visit Water Tower Fine Wines at 6136 Campus Lane in Mt. Washington, and you will find such an oasis of wines, champagnes, sparkling wines and more. Shopkeepers David and Jan Lazarus pride themselves on having the largest selection of wines in the tri-state area. They also offer the largest selection of champagne (180 varieties) and sparkling wines (130 varieties) in the United States. If you love wines, you’ll have a blast looking and buying from this unique and vast selection. “I have extremely eclectic tastes,” says David Lazarus. “That’s why we have a couple thousand wines in the store.” The wines are from all over the world—California and other states, also Israel, Greece, France, Spain, Portugal, Italy, Germany, Australia, South America, and more. One attraction of this shop is the weekly Friday Night Tasting Event. Each Friday from 5:30 to 8:30 p.m. the shop has a lavish wine tasting. Heavy appetizers are served (Key staff was invited recently and all was yummy, especially the wines!). Tastings range from $12 to $40 per person, depending on the price points of the wines being tasted that particular Friday. 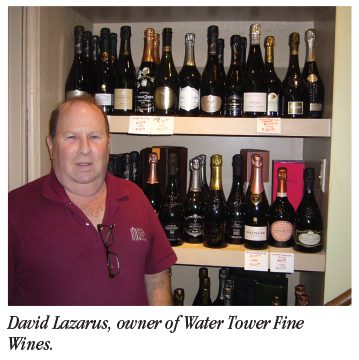 One reason Water Tower Fine Wines is better for visitors to the area is the Lazarus approach to shop hours of operation. 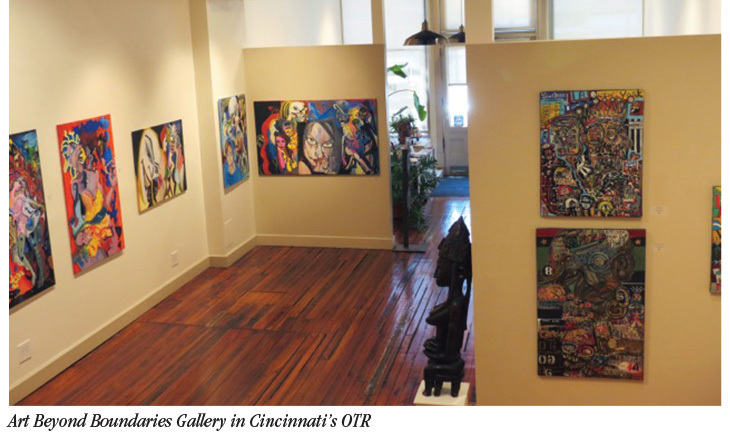 The store is open for a limited number of hours each week, but call the shop (513-231-9463) and the proprietors will open the store by appointment. So if you can only make it after hours on a Tuesday, call, and work it out with David or Jan, and they’ll be there. Regular hours are: 12 – 6 p.m. Tuesday, Wednesday and Thursday; 12 – 10 p.m. Friday: and 12 – 5:30 p.m. Saturday. Asked about the average customer frequenting the shop, the answer is there is no average buyer of wines. Water Tower Fine Wines has a wide range of price points to satisfy all kinds of shoppers, from those who want good quality at a lower price to those who collect the rare or special vintages. There are also wonderful selections of port, dessert wines and other specialty wines. For instance, Kopki vintage port selection includes many a 1900s bottle: including a ’91, ’78, ’75, ’66, ’60, ’55 and ’51. That’s just one label. Lazarus can help the novice find wines that will satisfy as well. For those who buy in case lots, there is a 10% discount for such purchases. Water Tower Fine Wines is a hidden gem…..worth the find…..see you there! If you want to by-pass typical blah bar eats for something better, and still enjoy the bar atmosphere, Key magazine recommends Zola Pub and Grill. 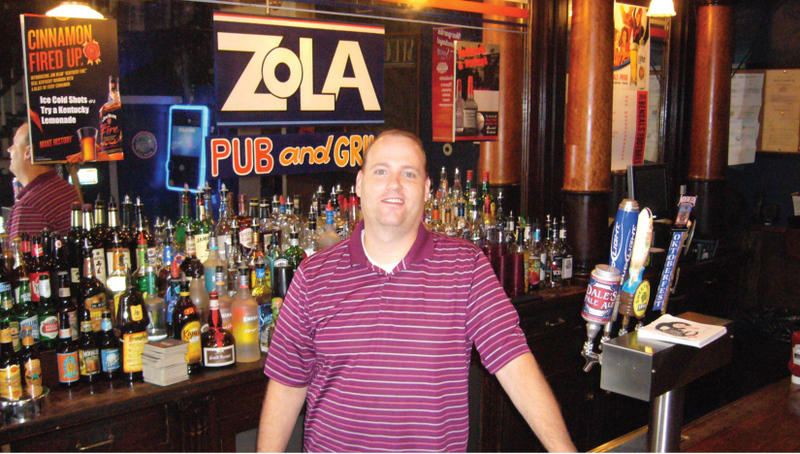 “We are driven by the restaurant (side) first, and by the bar/pub second,” said Matt Heringer, owner and proprietor of Zola Pub and Grill. He claims the bar/pub part is the easy part, but getting the food right, putting good, wholesome, delicious food on the table requires more. “We use fresh ingredients,” he said. That does make a huge difference in taste, texture and flavor. For instance, burgers are a big part of the menu at Zola. Those burgers are 100% Black Angus beef ground from chuck that is fresh and never frozen. The patties are 8-ouncers, not the typical 4-ouncer. Contrast that with the typical bar/pub burger made of unspecified ground “beef” patties with fillers, pre-made by a food processor, frozen, shipped, thawed and popped on the char-grill. Which would you rather have? Me too—Zola’s burger is EXCELLENT. That’s true, too. For instance, Zola burgers range from $6.50 to $8.50. The burger is fresh Black Angus every time, it’s larger than average, it’s cooked to order, served on a Kaiser roll, and it comes with choice of one side, such as steak fries, a cup of soup, pasta or potato salad, or Asian slaw. Take it from us area burger hounds, that’s a deal! Asked about burger favorites, Heringer’s response was immediate: “The black and bleu ($6.95) and the spicy Jack ($7.25). There are nine burger choices on the menu, and every Wednesday is Burger Mania, meaning a burger with five toppings and a side for only $6! A serious deal! But pub-goers do not live by the burger alone. There are pizzas, such as the Greek, featuring grilled gyro meat, red onions, mushrooms and black olives over red sauce, all topped with mozzarella cheese. Dinner salads are waiting, such as the grouper, the fish grilled with Caribbean jerk seasoning, on a bed of greens and Swiss cheese, egg, banana peppers, tomatoes and black olives, in a sweet and sour dressing. Wings, of course, jumbo split and fresh, in original, garlic and BBQ flavors, and spiced to your liking (Monday is Wing Night…50 cents apiece). Most everybody knows who Abraham Lincoln is, right? And the history: U.S. president, American Civil War, assassination; all well known. What you may not know is you can eat in a Cincinnati restaurant that opened in 1865, the same year all the above history was happening. Mecklenburg Gardens is the place, and it’s been at the same location since it opened its doors in 1865. A plot map on the wall at Mecklenburg’s shows what the neighborhood looked like back then. Today, the garden part of this historic restaurant is magnificent. The garden is vine covered by ancient growth to create an enchanting leafy-green canopy for real, honest-to-goodness bier garten dining. Even when the July sun is blistering above or the stifling summer heat still radiates late into the evening, you’ll find the garden to be a cool spot to relax and socialize. Whether you take a table outside or in, also you will find many great beers—some from the Fatherland—on tap and waiting for you. You will find a German core to the menu, but lots of other options for your dining pleasure as well. The menu features a small plates section, where items such as bier braised short ribs are found. There are eight sandwich choices, many with a German heritage. Rounding out the bill of fare are salads, soups, sausages, schnitzels and homemade desserts. Proprietors Tom and Annamarie Harten welcome guests in an Old World manner, proud and pleased to have visitors to Greater Cincinnati among their patrons. 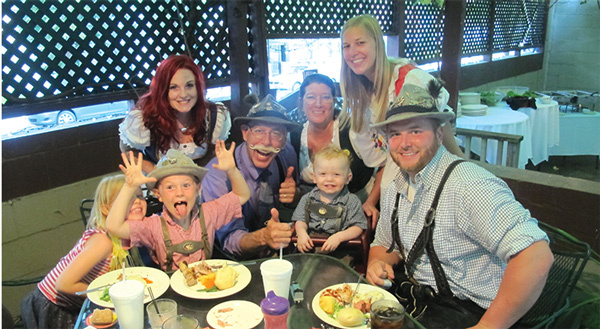 Oktoberfest, the quintessential Teutonic tradition, is in season pretty much all the time at their German eatery. The Hartens and staff just celebrated their 18th grand reopening anniversary while they look forward to the 150th anniversary of the original opening in 2015. And ahhh, that hearty German cuisine! Wiener schnitzel perhaps leads the popularity parade at Mecklenburg Gardens, and is one of several Key magazine favorites. The centerpiece is a “Viennese cutlet,” of veal, which is scalloped in an egg wash and secretly seasoned bread crumbs, then gently sautéed to a crispy finish. Another Key favorite is sauerbraten, a very German, very different, and very tasty dish. The name means “sour roast” in German. Its preparation begins days before your order is placed—three to four days! The beef roast is submerged in a sour-sweet marinate, more sour than sweet, and given its character by gingersnaps. After marinating, the meat is browned, then simmered for several hours in the reserved marinate. The result is an extremely tender roast and a delicious, semi-thick sauce to go with the beef slices. But wait a minute! We have not had a beer as yet, have we? You must! if you are a beer lover. Ever been in a true Italian restaurant in Philly or the Big Apple? It’s a special experience, no question. Just such an experience awaits you at Pompilios, here in Newport, Kentucky (a few minutes from Fountain Square). There’s a very special bonus, too, besides, because the toothpick scene in the movie Rainman, with Dustin Hoffman, was filmed in the bar at Pompilios. Let’s go to the tavern first, just for drinks if you want. It’s a great destination hot spot for satisfying a thirst. For starters, you will see one of the very best tied-house back bars in the Midwest, built the year FDR entered the Whitehouse—1933, when Pompilios opened for business. Colonel Pomp’s Tavern features period photos of the 1930s, but the bar area itself is that old, so you’ll step back in time. Also, the scene from Rainman was filmed in that very place, for an even richer taste of history. Colonel Pomp’s features a good number of Greater Cincinnati’s very best craft beers on tap, which visitors love to try. Hit the tavern on a Thursday or Friday in June, and you’ll be treated to live music from an assortment of talents featuring boogie woogie, acoustic Americana rock, jazz, blues and more. Our suggestion at Key magazine is go there and experience Colonel Pomp’s as a great hot spot, but get yourself a table inside or out at the bocci bar, and have a meal too, lunch or dinner. We mentioned red sauce because Pompilios features some of the best red-sauce dishes in an area with a lot of very good Italian eateries. Pompilios has a slew of Taste of Cincinnati winners on their menu, so ask your server about the blue ribbon dishes. Also, the place has been voted into the Italian Restaurant Hall of Fame. Many visitors to Greater Cincinnati ask Key magazine for a better-than-bar-food place to eat—so, they want good food—but with the energy and action of a hot bar scene. 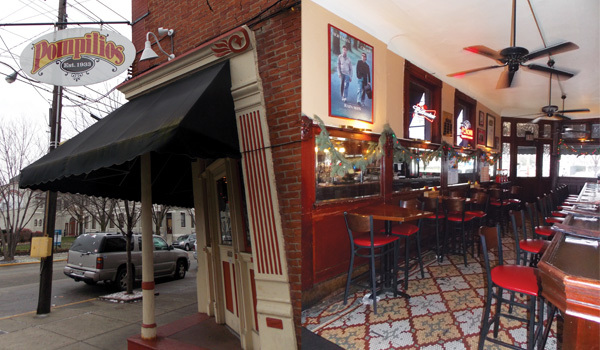 We have the place for you—Cosmo’s on Main Street in MainStrasse Village, Covington (Northern Kentucky, just five blocks across the bridge over the Ohio River). She enthusiastically cited the parmesan cream pasta as an example. “The pasta is mixed with sautéed vegetables and tossed in our parmesan cream sauce, which you can have as is, or you can add blackened or grilled chicken or grouper” if you want protein as well. Collins gave equally high marks to the Cajun cream pasta, with a sauté of peppers, tomatoes and onions, with a Cajun lemon cream sauce, and the options of chicken or fish, grilled or blackened. Both are hearty, hefty entrée dishes, and both reasonably priced. Looking over the menu, you’ll find lots of comfort food that goes good with the many draft beers and a back bar mixed drinks available. The comfort food includes dishes such as pub-style fish & chips. Also, there is a sizeable list of burgers, including a crowd favorite called the Santa Fe burger. All burgers are _-pounders, and the Santa Fe includes a black-bean and corn salsa to accompany the burger fixins. While there are plenty of bar-style appetizers, also there are items such as the spinach & artichoke dip, and chicken and cheese quesadillas. And the menu includes salads, pizzas, calzones, sandwiches and wraps, along with entrée dishes—all tasty and better than your average bar bill of fare, according to Collins.